A couple of weeks ago, here at The Data Science Lab we showed how Lloyd’s algorithm can be used to cluster points using k-means with a simple python implementation. We also produced interesting visualizations of the Voronoi tessellation induced by the clustering. At the end of the post we hinted at some of the shortcomings of this clustering procedure. 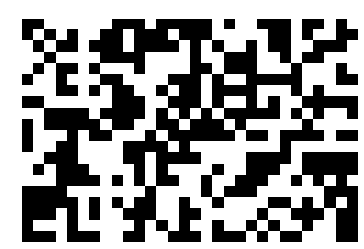 The basic k-means is an extremely simple and efficient algorithm. However, it assumes prior knowledge of the data in order to choose the appropriate K. Other disadvantages are the sensitivity of the final clusters to the selection of the initial centroids and the fact that the algorithm can produce empty clusters. In today’s post, and by popular request, we are going to have a look at the first question, namely how to find the appropriate K to use in the k-means clustering procedure. 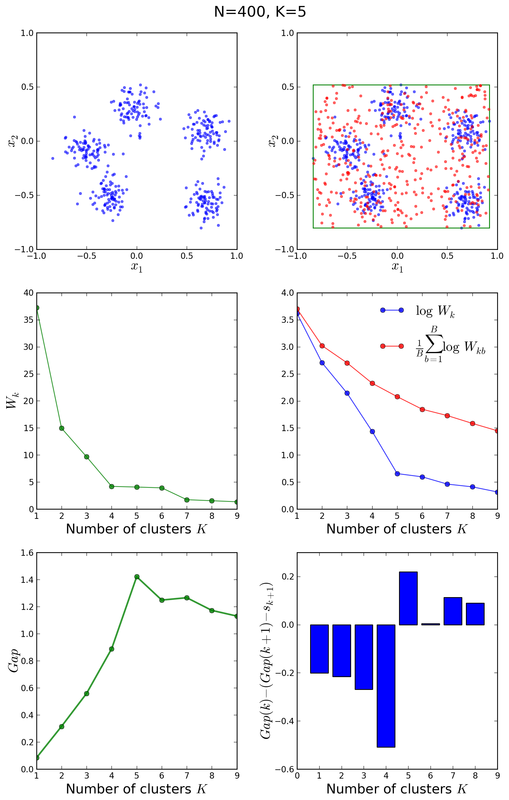 Clustering consist of grouping objects in sets, such that objects within a cluster are as similar as possible, whereas objects from different clusters are as dissimilar as possible. 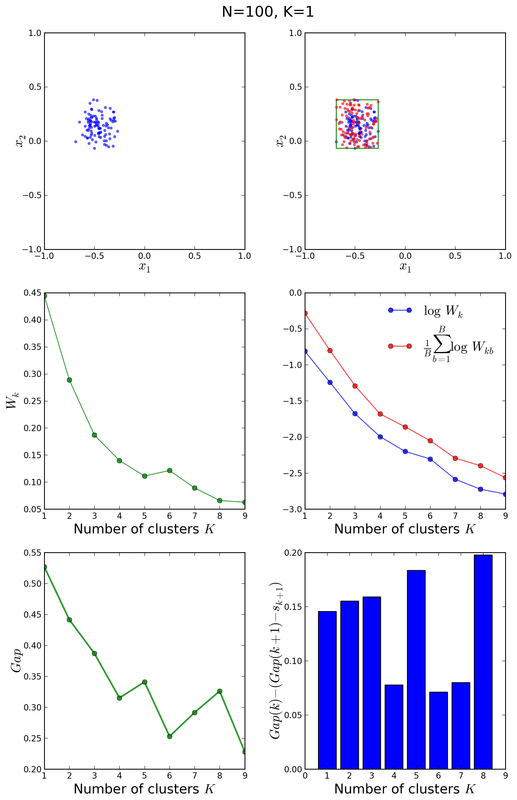 Thus, the optimal clustering is somehow subjective and dependent on the characteristic used for determining similarities, as well as on the level of detail required from the partitions. 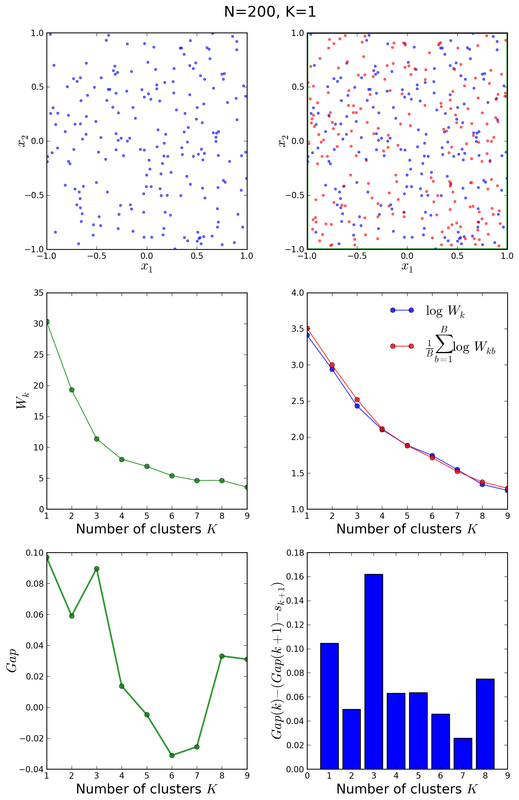 For the purpose of our clustering experiment we use clusters derived from Gaussian distributions, i.e. globular in nature, and look only at the usual definition of Euclidean distance between points in a two-dimensional space to determine intra- and inter-cluster similarity. This variance quantity is the basis of a naive procedure to determine the optimal number of clusters: the elbow method. 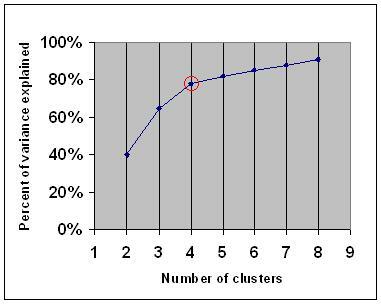 If you graph the percentage of variance explained by the clusters against the number of clusters, the first clusters will add much information (explain a lot of variance), but at some point the marginal gain will drop, giving an angle in the graph. The number of clusters are chosen at this point, hence the “elbow criterion”. But as Wikipedia promptly explains, this “elbow” cannot always be unambiguously identified. In this post we will show a more sophisticated method that provides a statistical procedure to formalize the “elbow” heuristic. Finally, the optimal number of clusters is the smallest such that . Cluster the observed data, varying the number of clusters from , and compute the corresponding . Generate reference data sets and cluster each of them with varying number of clusters . Compute the estimated gap statistic . With , compute the standard deviation and define . Choose the number of clusters as the smallest such that . The gap statistic is implemented in the following code snapshot. Note that we use for the reference datasets and we span values of from 1 to 9. We shall now apply our algorithm to diverse distributions and see how it performs. Using the init_board_gauss(N, k) function defined in our previous post, we produce an ensemble of 200 data points normally distributed around 3 centers and run the gap statistic on them. The upper left plot shows the target distribution with 3 clusters. On the right is its bounding box and one Monte Carlo sample drawn from a uniform reference distribution within that rectangle. In the middle left we see the plot of that is used to determine with the elbow method. Indeed a knee-like feature is observed at , however the gap statistic is a better way of formalizing this phenomenon. 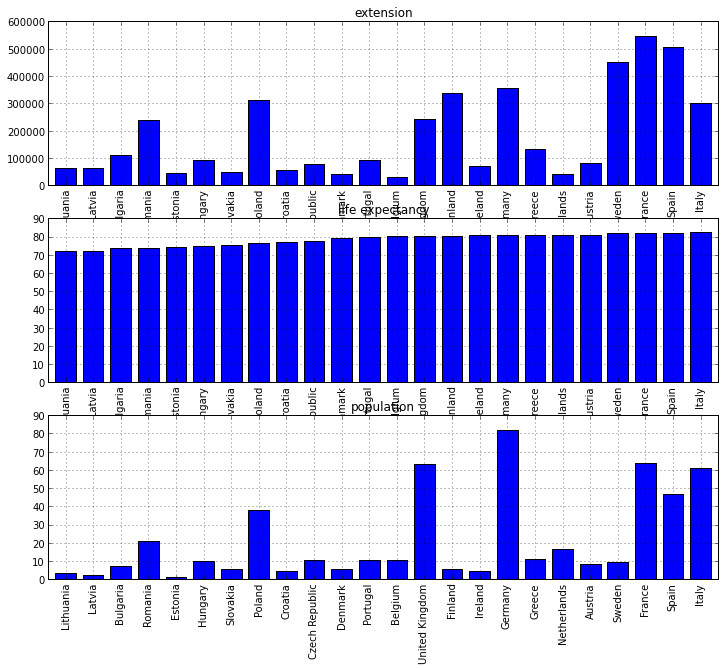 On the right is the comparison of for the original and averaged reference distributions. Finally, the bottom plots show the gap quantity on the left, with a clear peak at the correct and the criteria for choosing it on the right. The correct is the smallest for which the quantity plotted in blue bars becomes positive. The optimal number is correctly guessed by the algorithm as . In this case, the elbow method would not have been conclusive, however the gap statistic correctly shows a peak in the gap at and the bar plot changes sign at the same correct value. It is clear in the above figures that the original and the reference distributions in the middle right plot follow the same decay law, so that no abrupt fall-off of the blue curve with respect to the red one is observed at any . The bar plot shows positive values for the entire range. We conclude that is the correct clustering. In this case, the algorithm also guesses correctly, and it is clear from the middle right plot that both the original and the reference distributions follow exactly the same decay law, since they are essentially different samples from the same uniform distribution on [-1,1] x [-1,1]. The gap curve on the bottom left oscillates between local maxima and minima, indicating certain structures within the original distribution originated by statistical fluctuations. 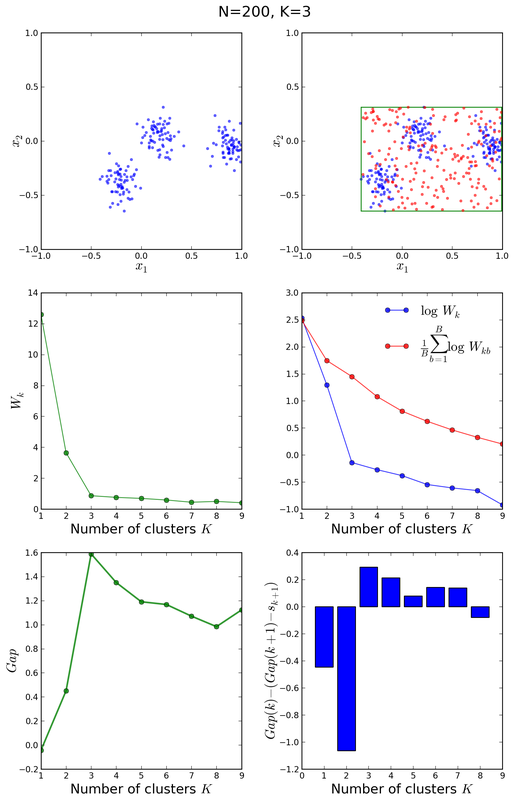 The estimation of the optimal number of clusters within a set of data points is a very important problem, as most clustering algorithms need that parameter as input in order to group the data. Many methods have been proposed to find the proper , among which the “elbow” method offers a very clear and naive solution based on intra-cluster variance. The gap statistic, proposed by Tobshirani et al. formalizes this approach and offers an easy-to-implement algorithm that successfully finds the correct in the case of globular, Gaussian-distributed, mildly disjoint data distributions. Update: For a proper initialization of the centroids at the start of the k-means algorithm, we implement the improved k-means++ seeding procedure. Update: For a comparison of this approach with an alternative method for finding the K in k-means clustering, read this article. Data visualization plays a crucial role in the communication of results from data analyses, and it should always help transmit insights in an honest and clear way. Recently, the highly recommendable blog Flowing Data posted a review of data visualization highlights during 2013, and at The Data Science Lab we felt like doing a bit of pretty plotting as well. For Python lovers, matplotlib is the library of choice when it comes to plotting. Quite conveniently, the data analysis library pandas comes equipped with useful wrappers around several matplotlib plotting routines, allowing for quick and handy plotting of data frames. Nice examples of plotting with pandas can be seen for instance in this ipython notebook. Still, for customized plots or not so typical visualizations, the panda wrappers need a bit of tweaking and playing with matplotlib’s inside machinery. If one is willing to devote a bit of time to google-ing and experimenting, very beautiful plots can emerge. 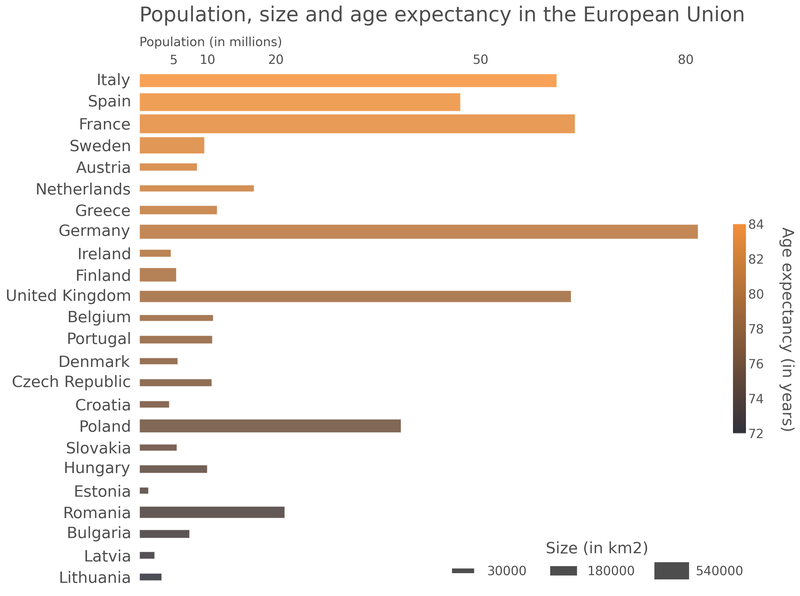 For this pre-Christmas data visualization table-top experiment we are going to use demographic data from countries in the European Union obtained from Wolfram|Alpha. Our data set contains information on population, extension and life expectancy in 24 European countries. We create a pandas data frame from three series that we simply construct from lists, setting the countries as index for each series, and consequently for the data frame. Now, thanks to the pandas plotting machinery, it is extremely straightforward to show the contents of this data frame by calling the pd.plot function. The code below generates a figure with three subplots displayed vertically, each of which shows a bar plot for a particular column of the data frame. The plots are automatically labelled with the column names of the data frame, and the whole procedure takes literally no time. While this is an acceptable plot for the first steps of data exploration, the figure is not really publication-ready. It also looks very much “academic” and lacks that subtle flair that infographics in mainstream media have. Over the next paragraphs we will turn this plot into a much more beautiful object by playing around with the options that matplotlib supplies. Colors are very important for data visualizations. By default, the matplotlib color palette offers solid hues, which can be softened by applying transparencies. Similarly, the default colorbars can be customized to match our taste (see below how one can define a custom-made color map with a gradient that softly changes from orange to gray-blue hues). The main plotting instruction in our figure uses the pandas plot wrapper. In the initialization options, we specify the type of plot (horizontal bar), the transparency, the color of the bars following the above-defined custom color map, the x-axis limits and the figure title. We also set the color of the bar borders to white for a cleaner look. After this simple pandas plot directive, the figure already looks very promising. Note that, because we sorted the data frame by life expectancy and applied a gradient color map, the color of the different bars in itself carries information. We will explicitly label that information below when constructing a color bar. For now we want to remove the grid, frame and axes lines from our plot, as well as customize its title and x,y axes labels. So far, the lenghts of our horizontal bars display the population (in millions) of the EU countries. All bars have the same height (which is set to 50% of the total space between bars by default by pandas). An interesting idea is to use the height of the bars to display further data. If we could made the bar height dependent on, say, the countries’ extension, we would be adding an supplementary piece of information to the plot. This is possible in matplotlib by accessing the elements that contain the bars and assigning them a specific height in a for loop. Each bar is an element of the class Rectangle, and all the corresponding class methods can be applied to it. For assigning a given height according to each country’s extension, we code a simple linear interpolation and create a lambda function to apply it. Having added this “dimension” to the plot, we need a way of labelling the information so that the countries’ extension is understandable. A legend would be the ideal solution, but since our plotting directive was set to display the column ['population'], we can not use the default. We can construct a “fake” legend though, and custom-made its handles to roughly match the height of the bars. We position the legend in the lower right part of our plot. Finally, there is another piece of information in the plot that needs to be labelled, and that is the color map indicating the average life expectancy in the EU countries. Since we used a custom-made color map, the regular call to plt.colorbar() would not work. We need to create a LinearSegmentedColormap instead and “trick” matplotlib to display it as a colorbar. Then we can use the usual customization methods from colorbar to set fonts, transparency, position and size of the diverse elements in the color legend. The final and most rewarding step consists of saving the figure in our preferred format. When producing a plot based on multidimensional data, it is a good idea to resort to shapes and colors that visually guide us through the variables on display. Matplotlib offers a high level of customization for all details of a plot, albeit the truth is that finding exactly which knob to tweak might be at times bewildering. Beautiful plots can be created by experimenting with various settings, among which hues, transparencies and simple layouts are the focal points. The results are publication-ready figures with open-source software that can be easily replicated by means of structured python code.